The complete registration of areas of cultural interest, monuments and public immovable cultural property in a single and systematic way requires the creation of an integrated information system. The architecture of the integrated digital registration system should include the descriptive incorporation of all Archaeological Sites and Historic Sites, Monuments, Protected Areas, Regional Zones and their wider environments, the full geographic recording of their data and relevant environmental data. The architecture of the Integrated Management Information System (MIS) should include a Geographical Information System (GIS) in a structured, modern, easy-to-use, unified platform, along with the development of a Relational Database (RDB) of the above-mentioned cultural protection thematic areas and their related elements, analyzed in the article. Methods of scientific approach are promising, since the choice of using the appropriate topographic, photographic and software tools is entirely consistent with the categorization and cultural significance of the recording objects corresponding to the individual fields of the information system. In addition, they provide data on existing damages and enable detection and assessment of areas of construction requiring conservation interventions. 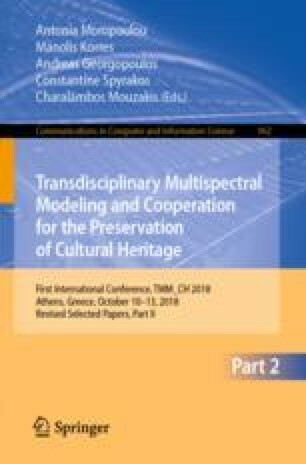 The extent and importance of the Greek cultural heritage requires the modification and optimization of the methodology of spatial identification and recording of real estate belonging to the Ministry of Culture, protection areas of the cultural environment and immovable monuments, so as to ensure the sustainable management and protection of the cultural object on Greek Territory, the design of their future conservation activities, access to cultural information and floating geospatial and cartographic data.